Exhibition until 2nd February 2013 at Nanshe Gallery. Damn! Don’t you love how some people have creative energy coupled with raw talent? Barbara Nanshe has it happening and it inspires awe. Until the 2nd of February she has new assemblages and jewellery on exhibit at her gallery in Beaumont St., Hamilton. 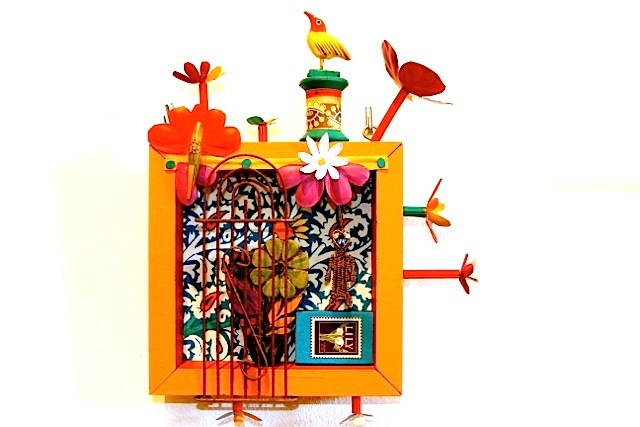 The small assemblages capture enigmatic tales that are woven with an intricate knowledge of dream and illusion. Using a collection of materials these fabricated journeys exist in a captured fantasy that are heightened by the playful shapes fashioned from stamped metal and delicate colourful patterning using paper and paint. Vibrant oranges, reds and blues juxtaposed against natural elements spawn cool meandering musings of popcorn fun, reminiscent of those innocent times of grandma and no shoes. And the bonus!!! 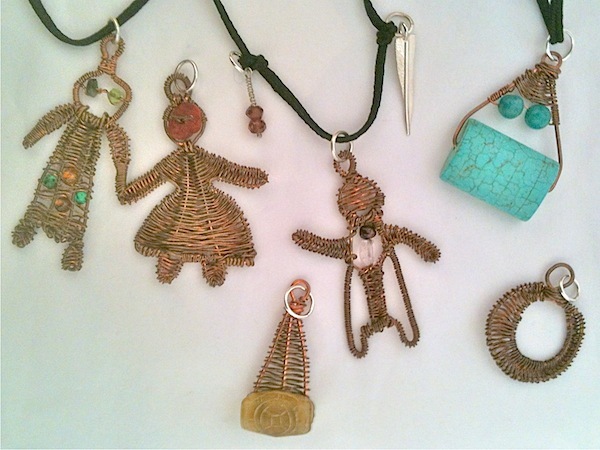 In all of these delicate assemblages exists your very own protective talisman, the Deva Doll, woven from copper wire and each made individual by incorporating a gem or two. Festooned amongst the finery of the assemblage is a decorated matchbox containing a cord to thread the doll onto. Wear with confidence knowing your charm has been blessed by the hands of a zealous artist with flair. Nanshe’s 12 month journey with her own artwork ignites 2013. It promises a grand assortment of exhibitions to come as this gallery heads towards its first anniversary. Medium: Copper, silver, glass, paint, found objects, paper, stamp pressed aluminium, wood.